Preheat oven to 375 degrees. Peel, core and slice apples vertically into 8 slices each. Cover with cold water to keep them from getting brown while you prepare the rest of the recipe. In a medium saucepan, mix the water, 3/4 cup of the sugar, butter and vanilla over heat and bring mixture to a boil. Separate each biscuit in half. Wrap biscuit dough layer around a slice of apple, stretching it to slightly overlap and seal the bottom. Place the wrapped slices sealed side down in a 9 X 13 baking pan. Pour the hot sugar mixture over the apple slices. 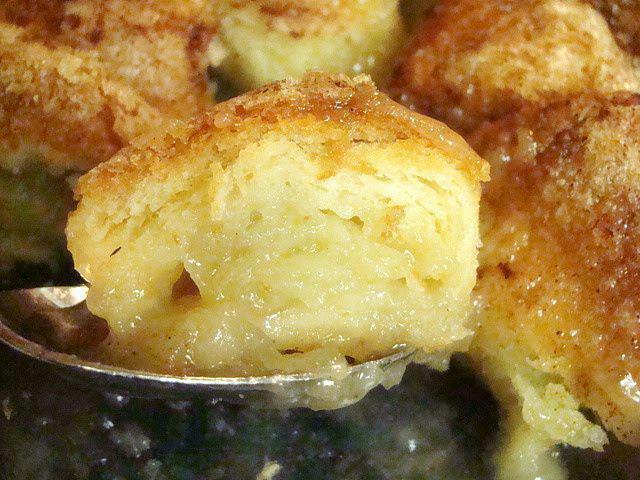 Mix the remaining 1/4 cup sugar with cinnamon and sprinkle over the tops of the wrapped apples. Bake for 35 minutes or until golden brown. Serve warm with vanilla ice cream!